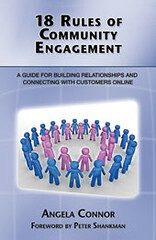 July 28, 2009: 18 Rules of Community Engagement listed as 15 Must-Read Social Media eBooks on SocialTimes.com. July 15, 2009: Angela Connor featured for a full hour on BlogTalk Radio’s Author Buzz with host, Deidre Hughey. July 1, 2009: Angela featured on the Guerilla Marketing Association call hosted by best-selling author Roger C. Parker. June 28, 2009: The Next Web lists “18 Rules of Community Engagement” as one of three recommendations on its popular Booklist 2.o.